When Virginia Bell and David Troxel created the Alzheimer’s Bill of Rights in the 1990s, they wanted to reframe the discussion around caring for people with dementia. Ask staff to sign the Best Friends™ Dementia Bill of Rights. Seeing your signature every time you pass by really builds buy-in. Stigma was common. Inform people with dementia of their diagnosis, treat them like adults, and enjoy meaningful activities? Controversial ideas at the time. Translated into 21 languages, the Alzheimer’s Bill of Rights helped articulate a new model of caregiving. Ask staff to sign the Best Friends™ Dementia Bill of Rights. Seeing your signature every time you pass by really builds buy-in. 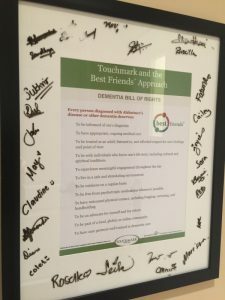 [/caption]Today’s Best Friends™ Dementia Bill of Rights keeps many of the original “rights” and adds new planks suggested by people with dementia, who told Virginia and David in great detail how they wanted to be treated! All of Virginia and David’s work—and the Best Friends™ Approach to Dementia Care—is based on this Bill of Rights. To be informed of one’s diagnosis. The Best Friends™ Dementia Bill of Rights. Una Declaración de Derechos de las personas con demencia. Source: The Best Friends™ Dementia Bill of Rights by Virginia Bell and David Troxel. © Copyright 2013, Health Professions Press, Inc.